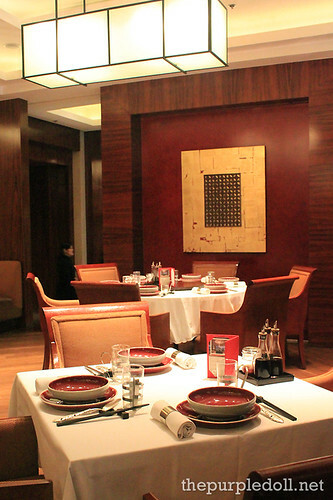 After a feast at Market Café two months ago, I found myself at the luxurious hall of Hyatt Hotel yet again. This time though, I'm in for a Chinese dimsum fest at one of the hotel's pride, the award-winning Li Li Chinese Restaurant which didn't only receive recognition from Philippine Tatler and Dineasia but was also part of Miele Guide's top 20 best restaurants in Asia. 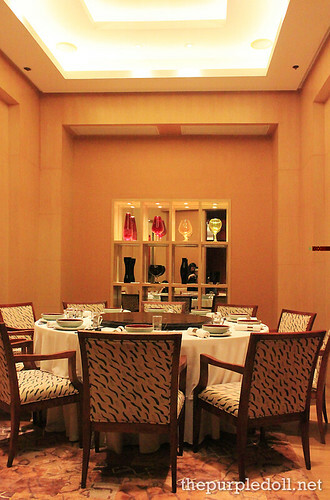 Located at Hyatt Hotel's 5th floor, this lavishly-decorated restaurant takes after a very prominent socialite in Hong Kong by the name of Lili Ho. Influenced by her high life, travels and love for tasteful art, the restaurant reflects Lili's elegant and charming home in Hong Kong not only through its authentic Cantonese cuisine, luxurious oriental interiors, sophisticated conversation pieces and ambient lighting, but also with its dining areas and function rooms. 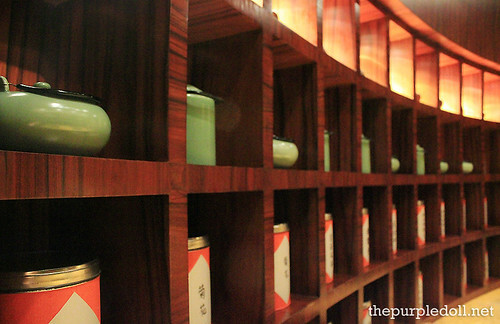 Aside from an upper and a lower dining section which houses table seating mostly for fours, Li Li also has a tea bar which boasts of a beautiful collection of Chinese teas. However, this is only the tip of the iceberg. 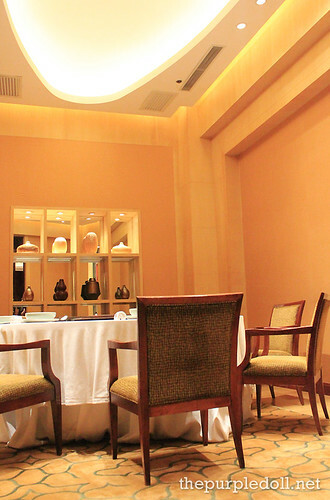 What captivated me at Li Li are their selection of function rooms inspired by actual portions of the socialite's home. 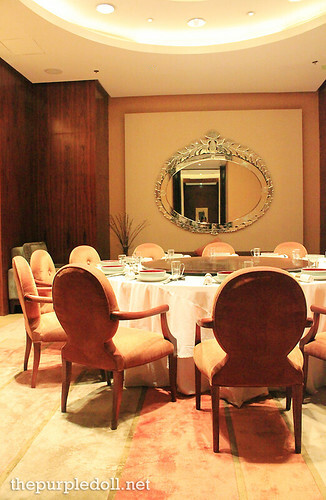 My favorite among the function rooms is the Library, a spacious and cozy dining room which doesn't only house a big round table for twelve, but also features books and mementos both of art and travel. 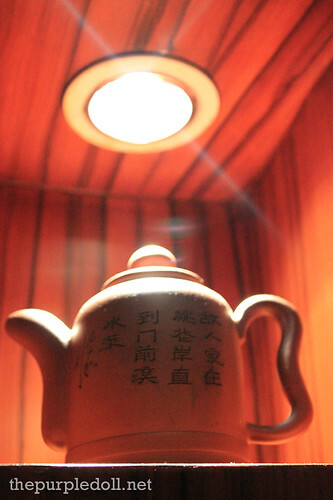 Although the library is where men hang out after dinner during Lili's time, the Library at Hyatt Hotel's Li Li Chinese Restaurant is gender neutral. 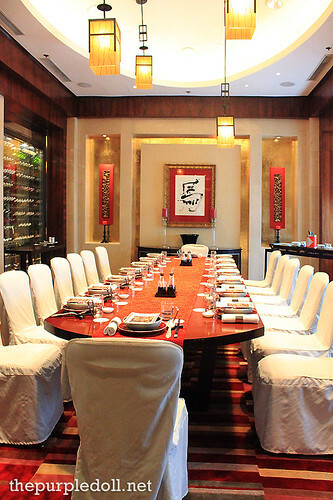 There are also private function rooms to pay homage to Lili's two daughters -- Bai Ling and Fei Fei. Both of these rooms are fairly small when compared to the Library. However, these rooms have a distinct charm with their warm color scheme and soft lighting. Another interesting room with a gender-based origin is the Drawing Room. Inspired by a section in Lili's home where women "withdraw" while men gather at the Library, the Drawing Room exudes a soft and feminine charm with a peach color scheme, decorative mirror and its own pantry. 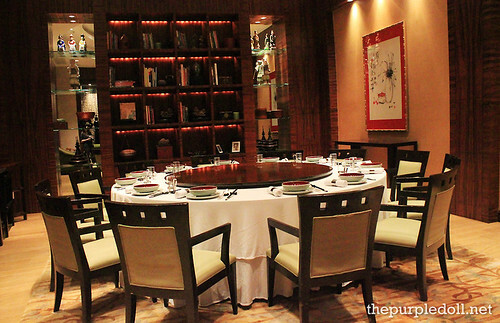 And last among the five function rooms was the wine shelves-lined destination for our dimsum feast, the Wine Cellar. 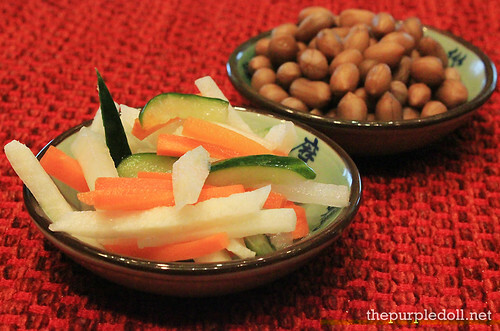 Before indulging in a festive selection of Chinese dimsum, our group first enjoyed these complimentary pickles and peanuts. Although the pickles were nothing extraordinary, the peanuts somehow reminded me of the ones I've tried at Xin Tian Di albeit not as soft and sweet. 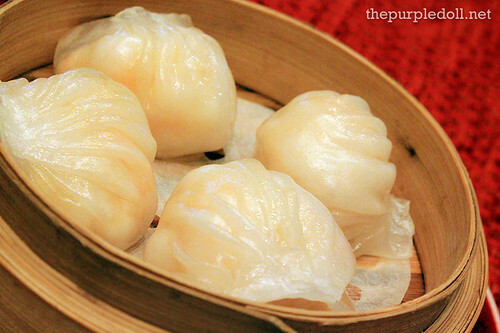 To start off the dimsum fest, we had Shanghai-style steamed pork and crab meat dumpling also known as Xiao Long Bao. These soup dumplings had a delicate and silky skin which encloses the pork and meat fillings swimming in a flavorful broth. Dabbed with some black vinegar and ginger shreds, these babies taste delicately beautiful. We were then served with this basket of Sio Mai which are steamed pork and dried scallop dumplings. After discovering meaty bundles of goodness at Frostea, my standards for good sio mai definitely upped by a whole notch. And as expected, Li Li didn't fail to deliver. These Sio Mai were very meaty, savory and oh-so-yummy. We also got to sample the dimsum favorite Har Gao or Hakaw which are steamed shrimp and bamboo pith dumplings. Although I just had a recent allergy breakout, I wasn't able to fight off the urge to devour these lovely shrimp dumplings. With a soft and slightly chewy coat encasing three pieces of plump shrimps, there was no way I'd say no. 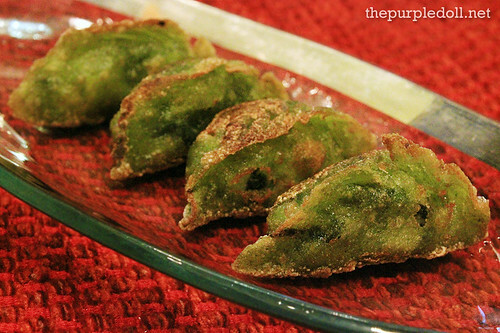 After a steamed start, we were off to fried delights with this serving of Pan-fried Shrimp and Spinach Dumpling. With juicy plump shrimps, savory spinach and a beautiful and crunchy green coating, this plate of fried dimsum was another winner. Every dimsum dish tasted great, but I was definitely partial to the Deep-fried Taro and Assorted Seafood Dumpling which was served with sweet chili sauce. 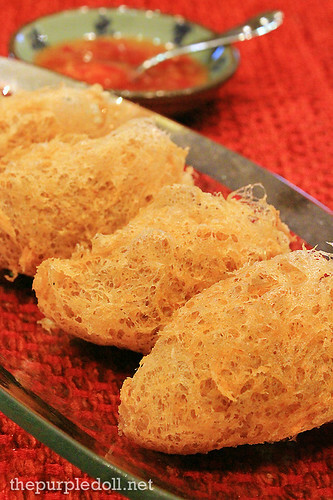 The crisp flaky skin was a delight to munch, but it was the sweet and savory taro and seafood filling that got me hooked. We also sampled a serving of the Beijing-Style Wok-Fried Pork Dumpling which was very meaty despite not being a total head-turner. 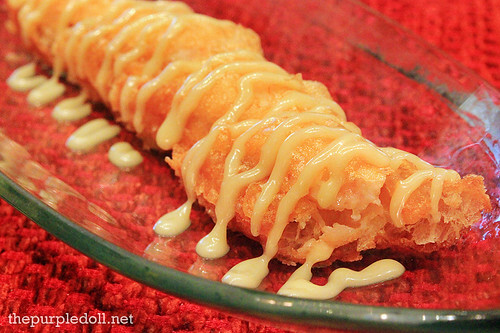 We also got to try the Deep-Fried Bicho-Bicho which enclosed shrimp bits and was drenched in wasabi-mayonnaise. Although I'm not really a big fan of bicho-bicho in general, Li Li's savory seafood version converted me to a believer. The dimsum selection at Li Li was more than enough, but Executive Chef Josef Miklavc even prepared a beautiful off-menu platter of Lobster and Asparagus Dumpling for our group. Although there's a cliché -- don't judge a book by its cover, these dumplings taste as good as they look. And if you're wondering, the bird centerpieces were edible. After a series of great-tasting dimsum delights, we were off to a sweet end with Li Li's famous Glutinous Dumpling with White Chocolate and Fine Peanuts. It was my first time to try this very original carb-loaded dessert, but boy it was good! 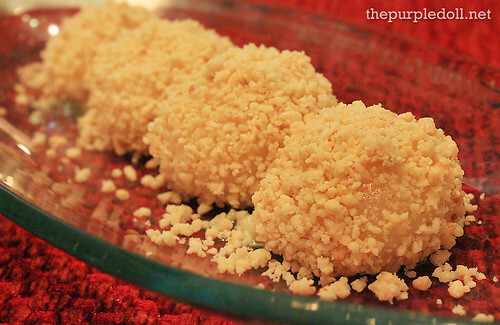 The peanut-crusted glutinous rice had just the right thickness which coated a dollop of creamy and sinful white chocolate. 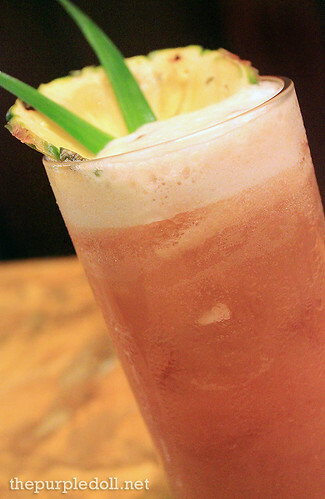 Of course, we didn't only have the right meal ender, but also the perfect meal companion, Hyatt Hotel's Signature Guava Iced Tea which was a truly refreshing blend perfect for a hot scorching summer day. I honestly don't go gaga for dimsum, but after this trip to Li Li Chinese Restaurant, I can't help but wish to go back for another visit. Every single dimsum dish we got to try was of excellent quality which proves why this restaurant has been a consistent award-bagger. And of course, who would dare ignore the lavish interiors and overall ambiance of Li Li's home in the comforts of Hyatt Hotel? 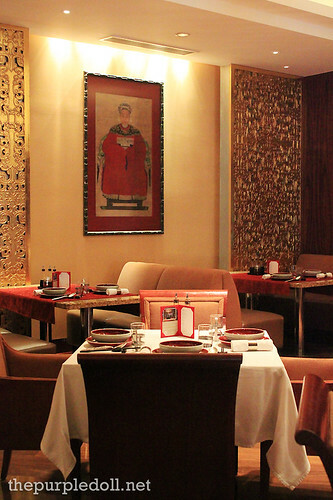 With outstanding food, service and atmosphere, I can definitely promise Li Li that I'll be back for more. 5/5 taste, if it is highly recommended by Sumi ,it must be really good .I believe you. Now, who is gonna invite me there? great food! and the price is pretty good too for a hotel buffet. i suddenly want to try that little duck! you made me craving for dim sum!!! i love them from ongpin to hong kong to penang! lucky you for having sampled li li! That dumpling covered with white chocolate captured my attention =)...so does the guava iced tea too. Love the name of the restaurant. Do they have one in Hong Kong as well? I go gaga for dimsum! Haven't tried Market Cafe yet and then there's Lili na. Now, I'm torn which one to go first. I haven't been to Hyatt yet, and this line up is quite appetizing. Amazing food creations!!! More than the food, I was fascinated by your tale of how each room has its own story. Now I'm curious about the life of Lili. I want to learn more about her. Hehehe This is not to say though that the food doesn't look good. Those dumplings look exquisite! wow, coming from a chinese food lover like you, this really must be good! awwww! you are really enjoying life's pleasures! Food food! I so love dumplings and siomai! 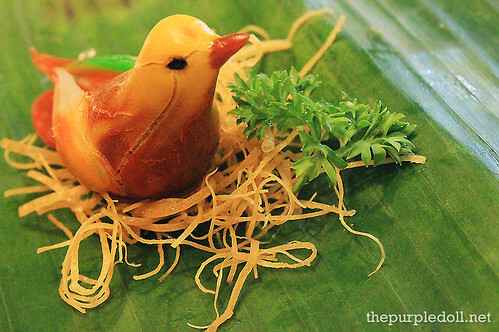 and that bird centerpiece is adorable...you almost don't want to eat it. The place looks amazing! perfect for a family dinner. Super wow! No wonder you're so happy and can't forget about the fest. Heavenly serving, indeed! Beautiful food presentation! I think I can stay here and eat 24/7 if possible...lols. like what i say before. pag maganda ang ambiance ng isang resto for sure maganda ang feeling mo habang kumakain i like the library room..
tas ang food, namiss ko tuloy ang binondo foodtrip. wow, that place is fit for royalty. hehe. It feels a bit intimidating to be in such an environment. My husband is a chinese food fan. I should definitely treat him here one time because I'm sure he'll simply enjoy the experience! I just need to save up for it a little bit more since it is a bit pricey for just dimsum. The dimsum-all-you-can promo sounds nice! If only I have a big appetite! I suddenly remembered the Xiao Long Bao at Din Tai Fung in SG. Food all looks so delish! At parang ang Sarap ng mga Pagkain.. I'm not very particular with the Chinese foods. What I like in one of the function rooms is the library. I like reading books on art and travel. Glutinous dumpling looks to die for! Oh dear dumplings. Oh dear. And eat all you can?! Expect a blog post soon about this place. Thanks Sumi! An array of scrumptious dishes! 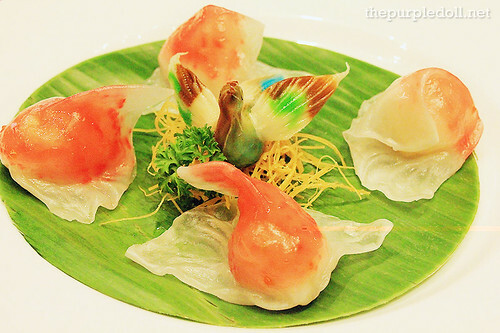 "Hyatt Hotel's Signature Guava Iced Tea"
Oh my that xiao long bao! I love it when you bite into it and the soup bursts out, bliss! 'Just dropping by. 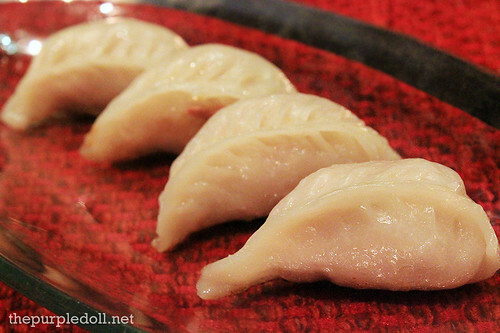 I'm salivating, I love dumplings. I want to eat the Bird decor ha ha ha! Great shots shobe Sumi! Please teach achie how to do this kind of shots! I would like to try the Deep-fried Taro and Assorted Seafood Dumpling served with Thai sweet chili sauce.I also want to sample a serving of the Beijing-Style Wok-Fried Pork Dumpling awwww tsalap siguro! Wish to visit this place too. HYATT wait for me! Great offerings. Good food! Sarap naman ... I definitely love Chinese food especially dimsum. I just don't know if I can afford Li Li. 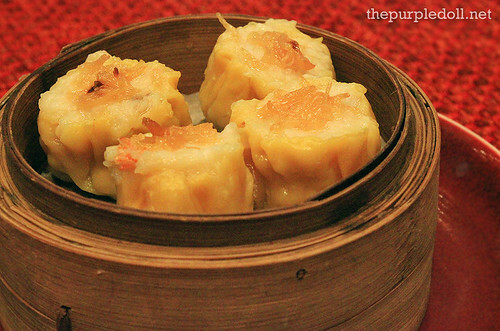 I am such a DIMSUM BABY... this post just got m drooling. Woaaah, dimsum galore. I've heard from a lot of people that this place is good. I'll probably bring my parents here, they love dimsum too! :) THank you for sharing. love your food photos, sumi! Great ambiance, good food. Can't wait to try it!